Of all the rock art sites I have seen in Morocco Imaoun South definitely represents one of the most fascinating and impressive places. It has – in favourable weather – a beautiful and colourful setting with wide views all around and especially the present-day isolation and tranquillity of the area was more than welcome for my wife and me, coming from built-up, busy and noisy Holland. As my wife and I cannot drive a car we were completely dependent on local guides to show us around. In most cases those guides offer a perfect service, but in a few instances we had a guide who – without informing us – decided several times not to show us all the rock art at some rock art sites near Akka. Even when we asked “is there more rock art further on?”, he insisted that there were no more petroglyphs, while we knew for sure that there was much more to be seen. Unfortunately, we were not in the position to expose this malfunctioning of the guide, being reliant on his services and goodwill at that moment. For that reason some sites could not be surveyed the way we had planned. It is possible that when you start reading the paper not all illustrations are visible. Unfortunately I have no control over this flaw in the TRACCE web site. However, you can read the paper with all illustrations in a PDF that (soon) can be downloaded at ResearchGate. I am sorry for any inconvenience. In fact Imaoun is the name of the extensive plain (feija in Arabic) about 155 km SE of Agadir and 30 km NNW of Akka, a town that is located just south of the well known sandstone ridge of Jebel Bani (Figure 1). 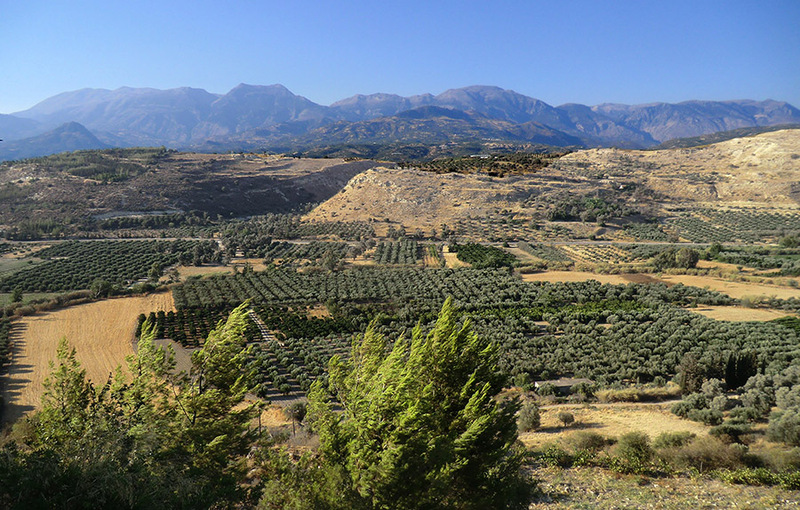 The Feija of Imaoun lies north of Jebel Bani and only a short distance south of the mountains of the Anti-Atlas. The plain is crossed by several dry river beds that – in wet times – empty their waters via the ‘foum’ (a wide, natural gap in the ridge) just north of Akka into the River Draa further south. The ‘foum’ near Akka is just one of the many gaps in the long ridge of Jebel Bani, and, because of the easy passage and the availability of (ground)water, rock art concentrated near such a ‘foum’ in many cases, like the rock art sites of Adrar n’Metgourine (NW of Akka) and Oum Alek and Aït Ouabelli (both south of Jebel Bani). Figure 1: Map of the locations of some of the rock art sites around Akka (red square). Inset: the location of Imaoun in southern Morocco. Drawings © by Maarten van Hoek; maps © by OpenStreetMap-Contributors. The rock art site of Imaoun South was probably first mentioned in a scientific publication by André Simoneau (1977: 109), while much later several rock art researchers mentioned and/or described several aspects of the rock art sites of the Imaoun Complex (Searight 1996, 1999, 2001; Salih and Heckendorf 2000; Garcin and Garcin 2004; Dupuy and Searight 2005; Gauthier and Gauthier 2015; Rodrigue, Auvray, Levallois and Villet 2016; Hermann 2018). Although one often speaks of the rock art site of Imaoun (often referring to only the main site), in reality there are several rock art sites in the area that are all labelled Imaoun (all only displaying petroglyphs). 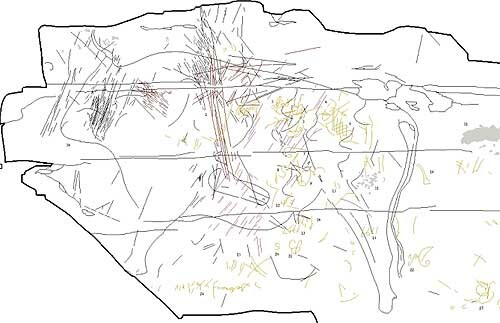 This group – of seven rock art sites – is labelled the Imaoun Complex in this study (Figure 2). Figure 2: Map showing the locations of the seven rock art sites at Imaoun, southern Morocco. The numbers indicate the minimum numbers of (possible) cupules at each site, resulting in a grand total of 1150 cupules. Drawing © by Maarten van Hoek; map © by Google Earth. In her extensive thesis about the rock art of Morocco Searight (2001) mentioned and briefly described three of the Imaoun sites. The main site is called Imaoun South (also referred to as Imaoun 1, also in this study), while only 110 m to the north – across a dry river bed – is Imaoun North (or Imaoun 2). About 1600 m to the west is Imaoun West (or Imaoun 3), while in 2013 Rodrigue, Auvray, Levallois and Villet (2016) discovered Imaoun NE (or Imaoun 4) about 5000 m to the NE of the main site. An important group of rock art sites, collectively referred to by me as Imaoun East (or Imaoun 5), was discovered and reported by Hermann (2018). About 5500 m to the SSW of Imaoun South is Imaoun SW (Imaoun 6), a rock art complex recorded by Salih and Heckendorf (2000). The three rock art sites they recorded near the village of Imitek are not considered in this study. 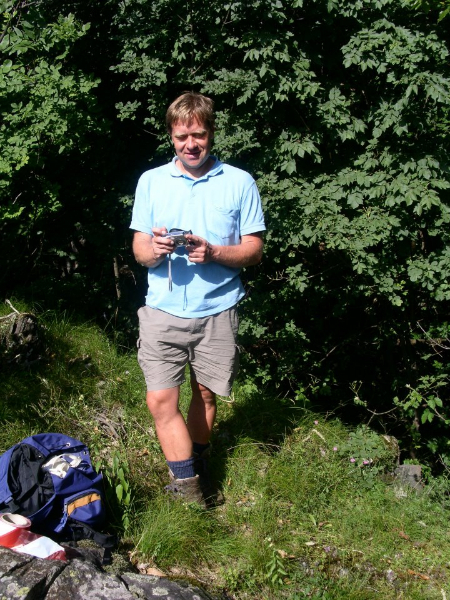 About 5 to 6 km SE of Imaoun South Dr. Luc Hermann (Hermann 2019/20) discovered a new rock art site. This new site is referred to here as Imaoun SE (or Imaoun 7). This study only will discuss a certain aspect of the Imaoun Complex, starting at and mainly focussing on the main site, Imaoun South. Imaoun South is a very extensive site. It occupies a low, slightly sloping plateau of hard Ordovician sandstone. The area measures about 700 m (N-S) by 230 m (W-E) and has steep escarpments that are facing west and north. The west escarpment is divided in two parts by a gap offering easy access to the plateau. The steep escarpments offer a mixture of outcrops and often large (tumbled and broken) boulders, while the plateau has numerous mainly flat outcrops and smaller boulders distributed mainly at the west part of the plateau, while large outcrop stacks and some large boulders build the very edge of the escarpment. Many outcrops and boulders have rounded and smoothened surfaces, polished by intermittent downpours, rushing water and by sand-storms and dust-devils that often ravage the area. Ongoing weathering and erosion caused many images to be very faint or even almost invisible. Yet, sharp angles and smooth, unpatinated rock surfaces also occur (indicating more recent breakage). Imaoun South offers a rich mixture of pecked and polished petroglyphs (generally estimated altogether to be more than 750, but not including cupules) depicting mainly quadrupeds (like domestic cattle, some antelopes and rhinoceroses) and some ostriches (mainly occurring at the west-escarpment). 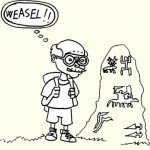 Petroglyphs of anthropomorphs are relatively rare. Also recorded at Imaoun South are about ten hunting/fighting Libyco-Berber scenes. One of these comprises a most elegantly executed scene involving three riders; at least two with a small round shield. 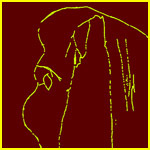 A third ‘shield’ might as well represent the lump of the camelid. I will return to this panel further on. Also important are the recordings of at least six chariots (Gauthier and Gauthier 2015) and – on one panel near the western escarpment – at least five petroglyphs of metal weapons that – though rarely – have also been recorded at other sites in the area (for instance at Adrar n’Metgourine, nearby Akka Issil and Tircht west of Icht). Remarkably, similar weapons have also been recorded at High Atlas sites (Rodrigue 1999: 371). Finally, there are some recently added ‘petroglyphs’ and – despite the remote location – a few most unwanted, ugly modern graffiti. However, Imaoun South is exceptional for its large number of polished spirals, cup-and-ring motifs and complex curvilinear designs that are often composed of several parallel lines (see my video about Imaoun South). Although spirals and other abstract designs occur at other sites in the larger area around Akka, such polished designs are said to be unique for Morocco but – according to Rodrigue et al. (2016) – are repeated at Imaoun NE. Yet, similar designs have also been reported at Djerat, Algeria (Huard and Leclant 1980: 311). 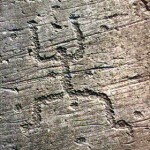 Most remarkable are the at least four, often deeply polished, outlined crosses (Dupuy and Searight possibly recorded seven examples [2015: 103]), also identified by some authors as Venus-Crosses. Especially the large cross on the plateau is particularly impressive. Most amazingly, outlined crosses occur in many parts of the world (Van Hoek 2018), but are extremely rare in Africa. 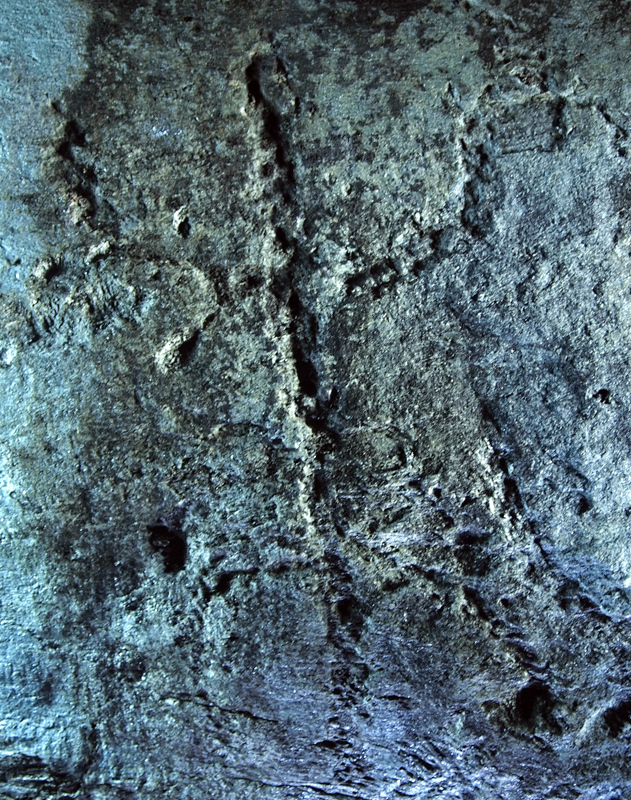 Importantly, Dupuy and Searight (2005) link the polished curvilinear petroglyphs of Imaoun South (including the outlined cross design) with similar imagery at the rock art site of Issamadanen in Mali, 1450 km to the SE. They also mention the presence of cupules at Issamadanen and state “La présence de dalles à cupules au voisinage de ces signes, non avérée en dehors d’Issamadanen, mérite d’être signalée.” (Dupuy and Searight 2005: 99). I agree, the presence of rock panels with cups in the vicinity of the petroglyphs at Issamadanen, is worthy of note indeed, especially as they further remark that cupules have not been recorded elsewhere in the Issamadanen area. Thus the presence of cupules at Issamadanen is thus rather exceptional and enigmatic. Remarkably, cupules are not common at rock art sites neighbouring the Jebel Bani ridge either. However, Searight (2001: 136) mentions three series of cupules at Adrar n’Metgourine, an extensive rock art site only 15 km south of Imaoun South and on the same route leading north though the ‘foum’ at Akka. In addition Rodrigue, Auvray, Levallois and Villet (2016: 47, Fig. 10) discovered five large blocks ‘with numerous cupules’ at Imaoun NE (Imaoun 4), only 5 km NE of Imaoun South. They further remark that all the cupule panels are located at the summit of the ridge at Imaoun NE. Some of the cupules are said to be five or six centimetres wide and one or two centimetres deep. Unfortunately they do not offer statistics, nor is there mention of possible cup-and-ring motifs at Imaoun NE. More importantly, a recent discovery by Hermann disclosed four rock art sites at Imaoun East (Imaoun 5) with altogether 187 cupules (Hermann 2018: Table). In this respect it is remarkable that Dupuy and Searight (2005) – and, as far as I could check, neither a single publication describing or mentioning Imaoun South – do not mention the presence of any cupule at Imaoun South, while in my opinion there are surprisingly many panels with numerous (possible) cupules at this magnificent site that must have been noticed by other researchers. In my opinion the cupules at Imaoun South are worthy to be described indeed. Before describing the panels with (possible) cupules at Imaoun South, I must emphasise that I did not undertake a full scientific survey at the site (therefore no scales are available). Consequently, the cupule panels that I describe in this study only represent the minimum. I certainly missed several cupule-panels, also because in many cases the light must be favourable in order to detect them. Moreover, not every panel was checked or could be checked for cupules (for instance in case of boulders being dislocated or partially covered by sand). Moreover, weathering and erosion may even have blurred cupules (and it certainly has obliterated many other petroglyphs) beyond recognition. 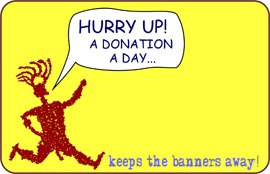 Finally, I must emphasise that a number of depressions at the purported cupule panels are not circular and also that some of the depressions might be natural; hence the remark that – in general – it concerns ‘possible’ cupules. The western escarpment primarily has zoomorphic petroglyphs (mainly of pecked cattle and ostriches) and only a relatively small number of cupules. Although many cupules (#375) at Imaoun South are found on the plateau, the main concentration of cupules is found below the edge of the northern escarpment, where in a very small area numerous cupules (#377) have been recorded. Finally, when using the term ‘panels’ it should be noted that in many cases cracks are ignored and thus the word ‘panel’ is a subjective term. The locations of some of the panels are (often very approximately) marked on the map of Imaoun South (Figure 3). Figure 3: Map showing the (approximate) locations of some of the rock art panels at Imaoun South, southern Morocco. Drawing © by Maarten van Hoek; map © by Google Earth. Panel-1: This small cracked panel, immediately next to a panel with a complex, weathered curvilinear design, has eight (possible) cupules of much differing sizes (Figure 4). There is no difference between the patina of the cupules and the natural surface. Panels 1 to 9 are located on the plateau north of the gap (some marked in Figure 3). Figure 4: Panel-1 at Imaoun South, southern Morocco. Photograph © by Maarten van Hoek. Panel-2: A large and fragmented outcrop has at least 19 rather small (possible) cupules of different sizes on its upper surface and at least six small cupules on its steeply sloping edge (where more cupules may exist, hidden by small stones and/or buried beneath sand) (Figure 5). Again there is no difference between the patina of the cupules and the natural surface. Only one hacked, faint petroglyph of two imperfect, concentric circles appears on this rock. Figure 5: Panels 2 and 3 at Imaoun South. Photograph © by Maarten van Hoek. Panel-3: A short distance from Panel-2 is a small rock with 18+ (possible) cupules (see Figure 5). There is no difference between the patina of the cupules and the natural surface. Panel-4: A triangular panel of a larger outcrop has numerous rather small, much weathered (possible) cupules (Figure 6). I estimate that more than 50 cupules exist on this panel (and there may be some more, hidden in the shade at that moment). There is no difference between the patina of the cupules and the natural surface. Figure 6: Panel-4 at Imaoun South. Photograph © by Maarten van Hoek. Panel-5: Near two petroglyphs of quadrupeds is a single, small depression that may be a cupule. There is no difference between the patina of the depression and the natural surface. Panel-6: Forming part of the edge of the western escarpment is a much sloping, triangular panel with at least 14 (possible) cupules of different sizes. (Figure 7). There is no difference between the patina of the cupules and the natural surface. Figure 7: Panel-6 at Imaoun South. Photograph © by Maarten van Hoek. Panel-7: Near the western escarpment is a boulder hidden among other boulders that has numerous depressions; all possibly representing cupules Figure 8). There are 86 (possible) cupules of differing sizes on its almost horizontal upper surface. There is no difference between the patina of the cupules and the natural surface. Figure 8: Panel-7 at Imaoun South. Photograph © by Maarten van Hoek. Panel-8: Forming part of the edge of the northern escarpment but still on the plateau is a large dome-shaped and cracked panel with at least 28 (possible) cupules of different sizes. (Figure 9). There is no difference between the patina of the cupules and the natural surface. There are much weathered curvilinear designs and a few zoomorphic petroglyphs on this panel (one possibly a lion?). Figure 9: Panel-8 at Imaoun South. Photograph © by Maarten van Hoek. Panel-9: From this panel – with at least six cupules – at the edge of the northern escarpment one has an excellent view of the area below the northern escarpment (Figure 10), including the huge boulder with numerous cupules (Panel-10) and a much smaller boulder below (Panel-11). Figure 10: View from Panel-9 at Imaoun South. Photograph © by Maarten van Hoek. At least 11 panels below the edge of the northern escarpment have (possible) cupules. It moreover seems that a huge boulder (Panel-9) below the northern escarpment once was part of the northern edge of the plateau and that it tumbled down to come to a rest halfway the steep escarpment. During this purported crash it possibly broke into several blocks. If this indeed happened, it is thus possible that Panels-10, 11 and 12 (all immediately below Panel-9 and all almost at ground level) once formed part of this huge boulder. Panel-10: This large boulder (Figure 11) is not only interesting because of possibly being re-located, but also because of the numerous cupules on its steeply NW sloping surface (in a position that is nowadays hard to reach). I estimate that about 90 (possible) cupules of differing sizes exist on this flat and smooth panel. Some of the cupules are joined forming a kidney-shape. In one case two cupules are joined by a short groove, so it seems. There is no difference between the patina of the cupules and the natural surface. Figure 11: Panel-10 at Imaoun South. Photograph © by Maarten van Hoek. Panel-11: Only a few meters down from Panel-10 is Panel-11. It is a smaller, but still a large slab of stone (Figure 12). Some of the 116+ (possible) cupules of different sizes on its smooth surface seem to have been broken off. The cupules have the same character as the cupules on Panel-9. This and its position relative to Panel-10 may indicate that it once formed part of Panel-10. Again, some of the cupules form kidney-shapes and several are joined, one by a small groove. There are some faint grooves that may represent (earlier?) petroglyphs. There is no difference between the patina of the cupules, the grooves and the natural surface. Panel-12: Partially covered by Panel-11 is a small block, possibly once a fragment of Panel-10 (it would have been very hard to manufacture those cupules on Panel-12 in this position). It has at least 9 (+?) cupules (Figure 12). There is no difference between the patina of the cupules and the natural surface. Panel-13: Almost touching Panel-12 is a long block of stone that also may represent a fragment of Panel-10 (Figure 12). There are at least 39+ (possible) cupules on its smooth surface. Some cupules are joined and a few are irregularly shaped. There is no difference between the patina of the cupules and the natural surface. There are several more similar blocks of stone lying around and some could have cupules on their now hidden surfaces. Figure 12: Panels 11, 12 and 13 at Imaoun South. Photograph © by Maarten van Hoek. Panel-14: A large block of stone near the NW corner has a smooth and steep, east facing surface with a large number of much weathered, rather shallow depressions (Figure 13). There are at least 39+ (possible) cupules, some of which are joined. There are also several, very faint grooves on this panel, while on another panel is a better preserved curvilinear design. There is no difference between the patina of the cupules and the natural surface. Panel-15: A short distance to the SW of Panel-14 is a small boulder with five cupules in an arc on its smooth, slightly sloping surface (Figure 13). There is no difference between the patina of the cupules and the natural surface. Figure 13: Panels 14 and 15 at Imaoun South. Photograph © by Maarten van Hoek. Panel-16: A boulder with a rather rough surface has at least nine (possible) cupules on its upper, sloping surface (and possibly more). Some of the much weathered cupules are rather large (Figure 14). There is no difference between the patina of the cupules and the natural surface. Figure 14: Panel-16 at Imaoun South. Photograph © by Elles van Hoek. Panel-17: Just south of the boulder with the outlined cross is a large boulder with some much weathered curvilinear designs. On its much sloping upper surface and in a large but shallow natural depression are five (possible) cupules. There is no difference between the patina of the cupules and the natural surface. Panel-18: This panel – located halfway the edge of the northern escarpment and the valley floor – has cupules probably of a different order. Superimposed upon some older and much weathered (curvilinear) designs are two confronting quadrupeds (and some other grooves). Below the legs of both animals is a cluster of 26 small and shallow cupules, while seven similar cupules hover over the animals (Figure 15). The cupules and the zoomorphs have a much brighter patina than the older petroglyphs and the natural surface of the stone. Especially the cupules of the larger zoomorph (a dog?) 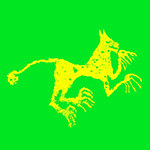 may represent or symbolise the tracks of the animal. Compare this with similar arrangements of cupules at feline petroglyphs in the High Atlas (Rodrigue 1999: for instance on pages 335, 336, 362 and 372). Figure 15: Panel-18 at Imaoun South. Photograph © by Maarten van Hoek. Panel-19: This small boulder has a flat, sloping upper surface with a fine arrangement of three Libyco-Berber riders respectively riding a horse, an elegant camelid and a donkey (?). Two of them have circular object (a shield); the third possible shield is in the shade (Figure 16). 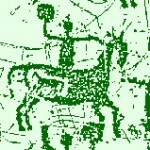 However, near the front legs of the horse are two circular depressions that could represent (earlier?) cupules. There is no noticeable difference between the patina of the cupules, the Libyco-Berber riders and the natural surface. Figure 16: Panel-19 at Imaoun South. Photograph © by Maarten van Hoek. Panel-20: Also this panel has an interesting combination of a zoomorphic petroglyph (a horse?) and cupules of different sizes. Panel-20 is found to the east of Panel-10 and forms part of the outcrop cliff of the northern escarpment. Its almost vertical surface has at least 30 (possible) cupules, including two possibly broken-off (doubtful?) examples (Figure 17). This panel is informative for two reasons. The cupules are found on a fixed surface (part of the outcrop), while the neighbouring, completely vertical panels are bereft of cupules. The manufacture of the cupules on this slightly projecting and almost vertical panel was therefore intentional. And, more importantly, four (possibly five) of the cupules have clearly been superimposed upon the large, outlined zoomorphic petroglyph (superimposition is rather scarce at Imaoun South; during our survey we only noticed one distinct instance of a quadruped superimposed upon a curvilinear design). Figure 17: Panel-20 at Imaoun South. Photograph © by Maarten van Hoek. Panel-21: Very near the corner of the northern and western escarpment but still on the plateau is a slightly east sloping outcrop panel with one much weathered cup-and-ring motif (much looking like the cup-and-ring designs that are so abundant in Galicia, Spain, and on the British Isles) and another curvilinear design (Figure 18). There is hardly any difference between the petroglyphs and the natural surface of the rock. Panel-22: Very near Panel-21 is another slightly east sloping outcrop panel with at least one even more weathered cup-and-ring motif and several other very faint petroglyphs, possibly including more cup-and-ring motifs that are not counted in this survey (Figure 18). There is no difference between the petroglyphs and the natural surface of the rock. Panel-23: Touching Panel-21 is another outcrop with one much weathered cup-and-ring motif and some other very faint petroglyphs (Figure 18). There is no difference between the petroglyphs and the natural surface of the rock. Figure 18: Panels-21, 22 and 23 at Imaoun South. Photograph © by Maarten van Hoek. Panel-24: A very short distance further east is an outcrop block with again one cup-and-ring motif on an surface that is steeply sloping to the east. It is similar to those shown in Figure 18. 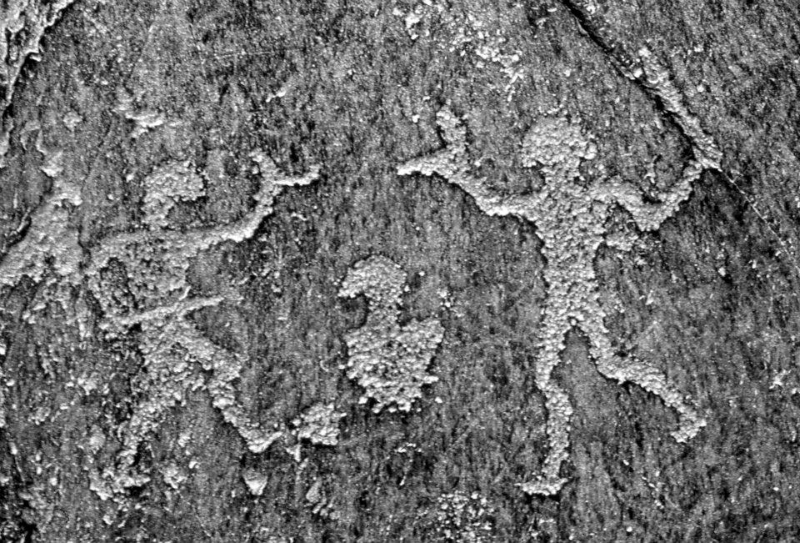 Again there is no difference between the petroglyphs and the natural surface of the rock. Panel-25: Much further south on the platform is a small boulder with one large cup-and-ring motif that almost entirely covers the much sloping surface (Figure 19). There is no difference between the petroglyphs and the natural surface of the rock. Figure 19: Panel-25 at Imaoun South. Photograph © by Maarten van Hoek. While preparing this paper it proved that during my survey I missed several panels with cupules, which will be described now. The descriptions of Panels 26 and 27 are based upon B&W photographs by Susan Searight (1999) and for that reason nothing could be said about differences in patination. Panel-26: Part of the prominent outcrop stack at the junction of the western and norther escarpment at Imaoun South is a panel (but not located at the plateau) with at least three sets of concentric rings with a cupule at their centre. On the panel – that has three parts sloping in slightly differing directions – are also two outlined crosses and other curvilinear designs. Possibly there is also one isolated (not ringed) cupule on this panel. My description is based upon Fig. 13 by Susan Searight (1999). Panel-27: On a slightly sloping part of the prominent outcrop stack at the junction of the western and norther escarpment is a panel (not located at the plateau) with a polished curvilinear design also including at least three sets of concentric rings with a cupule at their centre. 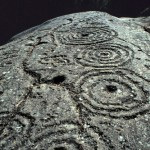 The examples on Panels-20 to 26 are probably the only cupules directly associated with the curvilinear art at Imaoun South. My description is based upon Fig. 14 by Susan Searight (1999). The descriptions of Panels 28 to 39 are based on photographs kindly supplied by Dr. Luc Hermann 2019: pers. comm.). However, all remarks regarding Panels 26 to 39 are completely my responsibility. Panel-28: At the extreme south end of Imaoun South but still on the plateau is a small concentration of panels with petroglyphs of chariots (Gauthier and Gauthier 2015). 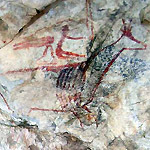 One of those panels also bears at least 29 much weathered (possible) cupules of slightly differing sizes, some probably abstract designs and the image of a small gazelle in the Tazina Style. There is no difference between the patina of the cupules, the gazelle and the natural surface, but the chariot has a somewhat brighter patina. It is obvious that the chariot is more recent than the cupules and the gazelle. But it is uncertain whether the gazelle and the cupules are contemporary. 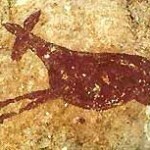 In general Tazina Style rock art is not associated with cupules. 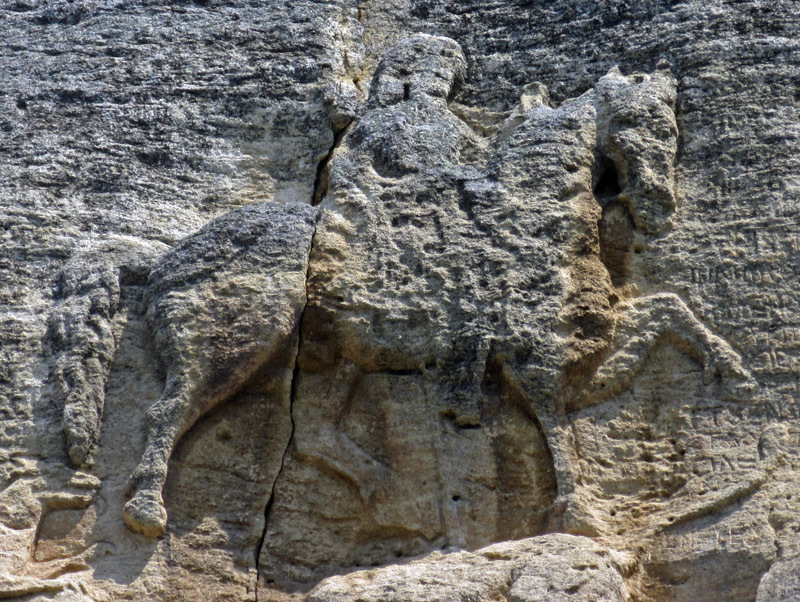 Panel-29: Just north of the gap in the western escarpment and on the plateau is a flat outcrop with a fully pecked quadruped and one much weathered (possible) cupule (Figure 20). There is no difference between the patina of the cupule and the natural surface. The patina of the zoomorph is somewhat brighter. Figure 20: Panel-29 at Imaoun South. Photograph © by Luc Hermann. Panel-30: A large fragmented outcrop on the plateau has a mix of abstract and biomorphic petroglyphs and at least one (possible) cupule. There is hardly any difference between the patina of the cupules and the petroglyphs and the natural surface. 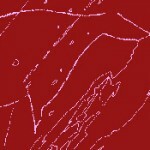 Panel-31: On a rather steep panel on the plateau sits a fully pecked, long-necked quadruped, which was interpreted by Hermann as a giraffe (2019: pers. comm.). On the rather rough surface are also at least six (possible) cupules, one superimposed (?) upon the animal’s body. There is no difference between the patina of the cupules and the purported giraffe and the natural surface. Remarkably, images of giraffe are not mentioned in any of the publications that I have available about Imaoun South, but it is possible that one outlined petroglyph on the western edge of the plateau in reality also depicts a giraffe (end of muzzle entirely pecked, though?) (location marked in Figure 3; see video for a photograph). Indeed, petroglyphs of giraffes are very rare in this part of Morocco. At least two giraffe petroglyphs are found at Imgrad n’Tayaline, a rock art site just SW of Adrar n’Metgourine, while there is a fine scene of two archers hunting two giraffes at Aït Ouabelli, 50 km SSW of Imaoun South. Remarkably, it is stated that at Oum Aleg – a major Tazina Style rock art site 32 km SSE of Imaoun – no giraffe images have been recorded (Pichler and Rodrigue 2003: Table 5, 104). However, we recorded at least two Tazina Style giraffes at Oum Aleg North during our surveys. Panel-32: On an almost vertical panel below the western escarpment are the petroglyphs of two fully pecked bovines and some grooves. Most importantly, ten (possible) cupules appear on the panel of which five are (partially) superimposed by the larger bovine (Figure 21). The cupules are of slightly different sizes and are more deeply patinated than the bovines. Figure 21: Panel-32 at Imaoun South. The arrows indicate the cupules that are superimposed by the bovine. Photographs © by Luc Hermann, both enhanced by the author. Panel-33: On the smooth surface of this panel – located at the western escarpment – are at least 25+ (possible) cupules, a possibly unfinished zoomorph, some indeterminate grooves and a clearly pecked, less patinated spiral. The cupules are of slightly different sizes and are less patinated than the natural surface of the panel. Panel-34: A large and smooth triangular panel on the plateau and near Panel-33 has at least 94 (possible) cupules of different sizes and sometimes irregular shapes (Figure 22). There may be more cupules buried beneath the sand. Some of the cupules are joined, at least two of them by a short groove. The cupules seem to be less patinated than the natural surface of the panel. Figure 22: Panel-34 at Imaoun South. Photograph © by Luc Hermann. Panel-35: Just below the edge of the western escarpment is a large, fragmented outcrop with partially a smooth and rough part on which sit altogether 34 (possible) cupules (Figure 23). The cupules are of different sizes and some are joined. There is no difference between the patina of the cupules and the natural surface. In this case it was difficult to tell anthropic depressions apart from natural depressions. Figure 23: Panel-35 at Imaoun South. Photograph © by Luc Hermann. Panel-36: Just below Panel-35 is a similar but much fragmented outcrop panel with at least 38+ (possible) cupules of different sizes. In the centre of the panel sits a fully pecked petroglyph of a quadruped (bovine?) Also in this case it was difficult to tell anthropic depressions apart from natural depressions. There is no difference between the patina of the cupules and the natural surface. Panel-37: A fragmented boulder at the extreme south of the plateau and at the same level as the feija has several curvilinear designs (including a clear spiral) and a few much obliterated (curvilinear?) patterns, all with a patina that is brighter than the rock surface. To the right are at least seven much weathered (possible) cupules that have the same patina as the natural rock surface. Panel-38: A large fragmented outcrop panel on the plateau has a few very fainted pecked grooves and at least two (possible) cupules (Figure 24). One of the grooves is rather deep, short and wide and looks like a much elongated cupule (not included in the statistics). There is no difference between the patina of the cupules and the natural surface. Figure 24: Part of Panel-38 at Imaoun South. Photograph © by Luc Hermann. Panel-39: On a steeply sloping surface of a fragmented boulder or outcrop at the western escarpment (about three meters north of Panel-33) is a rather complex pattern of pecked grooves that are slightly brighter patinated than the rock surface. On this panel are at least four or five depressions that could be (possible) cupules. As far as I know, no cupules have been recorded at the sites of Imaoun 2 and 3, at least there is no mention of any cupule in the publications or evidence in the photographs that I have available. Also at the rock art complex at Imaoun SW or Imaoun 6 (Salih and Heckendorf 2000) no cupules seem to have been reported. However, these observations do not mean that there are no cupules at those sites. Absence of proof is no proof of absence. A different matter is Imaoun NE (Imaoun 4). In 2013 Rodrigue, Auvray, Levallois and Villet discovered a rock art concentration about 5 km NE of Imaoun 1. At that site they recorded five large blocks, located at the summit of the ridge, bearing numerous cupules, some of them five or six centimetres wide and one or two centimetres deep (2016: 47). Unfortunately they did not mention the total number of cupules, but their photo (Fig. 10) of one the boulders shows at least 28 (possible) cupules of much differing sizes in a completely random arrangement. I therefore estimate the total of cupules at Imaoun NE (Imaoun 4) to be around 100 cupules. Surprisingly, Dr. Luc Hermann who visited Imaoun 4 later could not find those five blocks. He tentatively suggested that recent building activity at the top of the hill may have disturbed the stones with cupules (2019 pers. comm.). 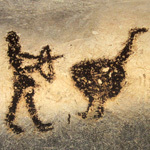 In fact, the once isolated site of Imaoun 4 can now be regarded to form the northernmost site of the chain of rock art sites discovered by Hermann in 2017. I have grouped the seven sites that Hermann describes (2018) in one general location: Imaoun East (Imaoun 5). Fortunately, Hermann offers statistics regarding the seven sites at Imaoun East (2018: Table). 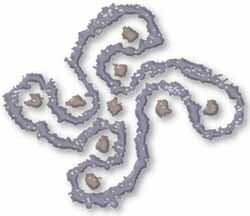 At four sites (Groups) he documented no less than 187 cupules spread over nineteen stones (Group 1: 6 cupules; Group 3: 1 cupule; Group IV-V: 44 cupules and Group VI: 138 cupules on 15 stones). He remarks that these cup-marks are sometimes as much as 6 cm in diameter and 3 cm deep and are similar to those found on other regional sites (Rodrigue et al. 2016: 47). He further remarks that these cupules are not all situated on flat surfaces (Hermann 2018: 18 – 19). Dr. Herman has been so kind to provide me with a number of photographs of panels from Imaoun 5 with cupules (Figures 25 and 26). It proves that in all cases that I could check the cupules are randomly arranged on the panel and are of different sizes. 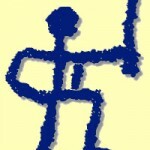 Associations with other petroglyphs (abstract design and/or figurative images) do not seem to occur. In at least two cases a single cupule clearly showed pecking and was found on the same panel combined with (but not necessarily associated with) other pecked petroglyphs. In most cases the cupules are much weathered having the same patination as the natural rock surfaces. Figure 25: Panel with cupules at Imaoun East. Photograph © by Luc Hermann. About 5 to 6 km SE of Imaoun South Dr. Luc Hermann (Hermann 2019/20) discovered a new rock art site with some rocks with cupules. This new site is referred to in this study as Imaoun SE (or Imaoun 7). It may be regarded as a southern outlier to Imaoun East. The modest number of cupules at Imaoun SE is not included into the grand total of the Imaoun Complex. Figure 26: Panel with cupules at Imaoun East. Photograph © by Luc Hermann. Finally, although not part of the Imaoun Complex, Hermann (2019: pers. comm.) recorded at least three panels with one or two cupules among the 115 decorated stones that he discovered in the Zaouira area (Hermann 2015), about 19 km south of Imaoun South and only 5.5 km SE of Adrar n’Metgourine (where three series of cupules have been recorded by Searight [2001: 136]). Dr. Hermann was so kind to provide me with photographs of the panels with the cupules. Three examples proved to be clearly pecked; one is somewhat doubtful. 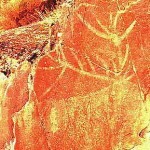 On three panels are several pecked, abstract petroglyphs that – in most cases – have a slightly lighter patination than the natural surface of the rock. Additionally, at Imgrad n’Tayaline (a rock art site about 300 m SW of Adrar n’Metgourine) Hermann recorded a boulder with two cupules, each about 3 cm in diameter (Luc Hermann 2019: pers. comm.). This study for the first time reports a huge number of cupules at Imaoun South. Our searches resulted in a surprisingly large number of (possible) cupules at that site. On the plateau of Imaoun South 375 examples (including the more doubtful cupule on Panel-5 and all inventoried cup-and-ring motifs) were recorded by Dr. Luc Hermann in 2018 and (later) by my wife and me. We also recorded no less than 377 cupules below the edge of the northern escarpment (including the three associated cupules on Panel-20). Hermann also recorded 111 cupules on five panels below the edge of the western escarpment. This resulted in a grand total of 863 (possible) cupules at Imaoun South. However, as not all panels could be inspected on this occasion, it is very well possible that there are more examples. 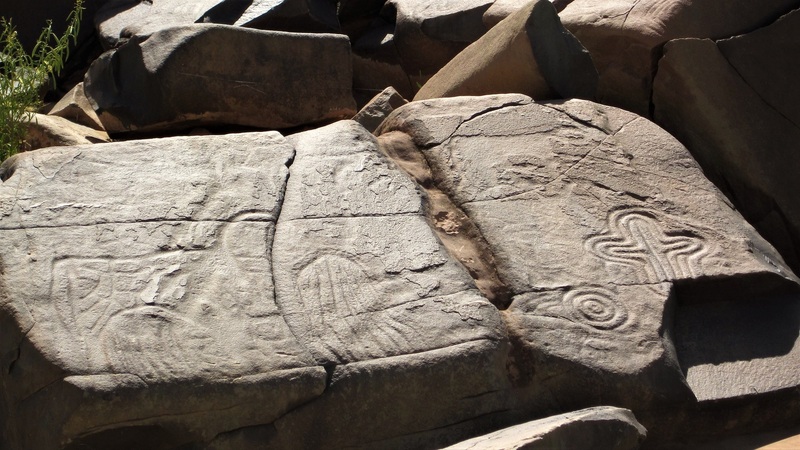 Moreover, it is certain that several petroglyphs have almost weathered of and/or are only visible with very favourable sunlight (especially those on horizontal surfaces). Altogether at the Imaoun Complex (Imaoun 1 to 6; 7 is not included in this survey) has no less than 1150 (possible) cupules, which is a remarkably high number knowing that cupules are rather scarce at rock art sites in southern Morocco. Even when half of the amount of cupules would actually be natural depressions, it still would be an impressive number. This high number might be explained by the fact that the Imaoun cupules are located on an important south-north route (and vice versa) from the Anti-Atlas through the Akka-foum to the River Draa and beyond. 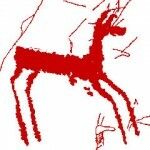 Yet, cupules seem to be absent (or simply not – yet – recorded) at the rock art concentrations near the Icht and Foum el Hassan ‘foums’ of the Oued Tamanart, which also provide important through routes leading north via the Oued Tamanart (a remote valley where also many rock art sites have been recorded). Therefore, for now the wealth of cupules in the Imaoun Complex north of the Akka ‘foum’ is still enigmatic. Although it is possible that some of the recorded cupules at Imaoun South are natural depressions, it should be noted that the definite natural depressions in the hard sandstone at Imaoun South are often much larger than cupules and often elliptical (although some may have been used as grinding stones). It is almost certain however that all cupules surrounded by concentric rings (on Panels 21 to 27) or possibly by spirals, are anthropic, although I consider those ringed cupules to form a category that is different from the numerous isolated cups at Imaoun South. Moreover, also the cupules on outcrop Panel-20 confirm that the depressions on that panel are anthropic, being superimposed upon an older zoomorphic petroglyph. Also the cupules on the almost vertical outcrop of Panel-32 on the western escarpment confirm that at least those cupules are anthropic. It must be noted that – as far as could be checked – all groups of cupules are randomly arranged (except for the row on Panel-15 at Imaoun South; an arrangement that may well be fortuitous). Moreover, the great majority of the cupules has the same patination as the natural rock surfaces. This in general may point to a rather great antiquity. The only clear exceptions at Imaoun South are the arrangement on Panel-18 – most likely comprising a Libyco-Berber scene of a later date – and the spiral-cupules combination on Panel 33. Yet, nothing can be said with certainty about the absolute age of the cupules of the Imaoun Complex. The great majority seems to be old and most of them are probably (much?) older than the Libyco-Berber imagery, which may not have been introduced until 500 BC in southern Morocco. 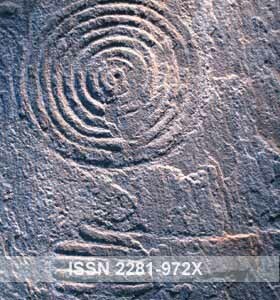 However, it is certain that the cupules surrounded by multiple concentric rings (on Panels 21 to 27) are definitely part of the repertoire of the polished curvilinear designs at Imaoun South and thus are definitely of the same age. In general the polished curvilinear petroglyphs at Imaoun South are considered to be rather old and even to represent the first stage of rock art production in the area (Rodrigue et al. 2015: 47). Therefore, unlike at Issamadanen in Mali, where nothing proves that the realisation of the cupules is contemporary with the abstract art (Dupuy and Searight 2005: 99), at least some cupules at Imaoun South are contemporary with the polished curvilinear designs. 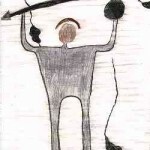 Whether the same conclusion goes for the situation at Issamadanen is uncertain. Finally, the Tazina Style petroglyphs (only very sporadically present at Imaoun South – for instance on Panel-28; see also the giraffe photo in the video) seem to date from 2500 (or even from 4000) BC to 500 BC, being slightly earlier than (or even being derived from) the Pecked Cattle Style. In at least one case a petroglyph of the Pecked Cattle Style (on Panel-32) was superimposed upon five cupules, which indicates that those cupules are older than the petroglyph and thus at least contemporary with (or even earlier than) the Pecked Cattle Style. This case also proves that the Imaoun cupules are old. However, as the time span in which cupules were manufactured is big and the contexts of their manufacture is most divers, it will be impossible to say anything definite about the age of every cupule in the Imaoun Complex. This paper would never have been so complete without the invaluable and much appreciated help of Dr. Luc Hermann, who supplied me with several photographs and kindly gave me permission to use a number of those pictures in this study. He moreover gave me useful information about several other rock art sites in the area. However, all the information in this study (also all the paragraphs based on his photos) and all possible mistakes and misinterpretations are only my responsibility. I also would like to thank Paul for arranging the excursion to the Imaoun Complex and Michel for safely driving us to and from Imaoun. Last but not least I thank my wife Elles for her – as always – invaluable assistance in the field and her support at home. Figure 27: Panel with petroglyphs at Imaoun South. The concentric rings motif has a very small dot in its centre and is therefore not included into the cupule-statistics. Photograph © by Maarten van Hoek. Dupuy, C. and S. Searight. 2005. Les signes graves à Issamadanen (Mali) et à Imaoun (Maroc), au regard de l’art abstrait ibérique. In: Roches ornées, roches dressées: colloque en hommage à Jean Abélanet; pp 97 – 108. Perpignan, Presses Universitaires. 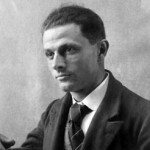 Garcin, A. and G. Carcin. 2004. Promenade autour d’Imaoun. Cahiers de l’AARS. Vol. 9; pp. 1 – 6. Gauthier, Y. and C. Gauthier. 2015. 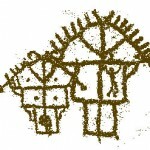 Nouvelles figurations de chars sahariens: technicité et positionnement chronologique relativement au style de Tazina. Cahiers de l’AARS. Vol. 18; pp. 5 – 68. Hermann, L. 2015. 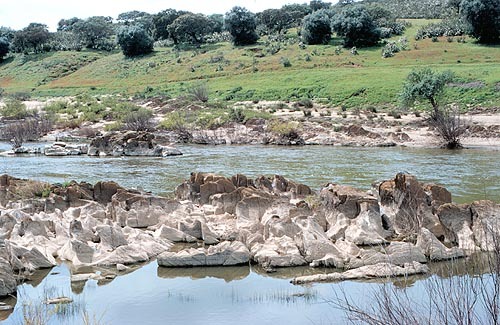 A rock art site in the Akka Oasis, Morocco. INORA. Vol. 72; pp. 6 – 11. Hermann, L. 2018. 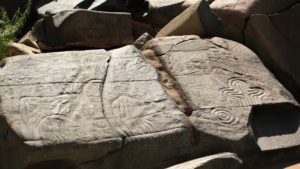 New rock art discovery at Imaoun (Akka, Anti-Atlas) in Morocco. INORA. Vol. 81: pp. 17 – 24. Hermann, L. 2019/20. Deux sites d’art rupestre à Imaoun (Akka, Anti-Atlas) au Maroc. INORA (submitted). Huard, P. and J. Leclant. 1980. 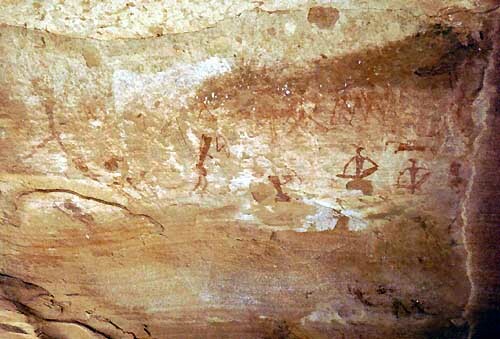 La culture des chasseurs du Nil et du Sahara. Mémoires du C.R.A.P.E., n°XXIX, Tome 2. Alger. Pichler, W. and A. Rodrigue. 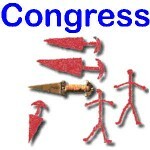 2003. The “Tazina Style”. Sahara. Vol. 14; pp. 89 – 106. Rodrigue, A., F. Auvray, J. Levallois and M. Villet. 2016. New rock engravings at Imaoun (Morocco). Almogaren. Vol. 46-47: pp. 45 – 54. Wien. Salih, A. and R. Heckendorf. 2000, Nouvelles stations d’art rupestre à Imaoun (Pré-Sahara, Maroc). INORA. Vol. 26; pp. 5 – 9. Searight, S. 1996. Imaoun: a unique rock art site in South Morocco. Sahara. Vol. 8; pp. 79 – 82. Searight, S. 1999. Imaoun: un site de gravures rupestres du Sud marocain. Cahiers de l’AARS Vol. 5; pp. 15 – 26. 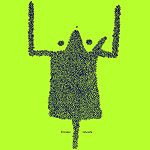 Simoneau, A. 1977. Catalogue des sites rupestres du Sud Marocain. Ministère des Affaires Culturelles. Rabat. Van Hoek, M. 2018. Possible Indications for Long Distance Diffusion of Rock Art Motifs in the Americas. In: TRACCE – Online Rock Art Bulletin, Italy.